Like many people, for some time I’ve been using the router that has been given to me by my internet service provider (ISP) and, mostly, it’s been something that I haven’t given an awful lot of thought to. However, network problems are not unusual so perhaps the time has come to think again. When I made my first faltering steps onto the internet back in the early 1990’s you had no choice but to buy the hardware to enable you to do it. You even had to install and configure the software – something that on my Amiga 4000 took several days to accomplish. Even when use of the interwebs became more commonplace it wasn’t unusual for a service provider to expect you to have your own equipment. Fast forward to the present day and modems have been replaced by routers and some ISP’s insist that you use their own hardware and won’t entertain the thought of you using anything else. Using both the Hub 3 and the Hub 5 has generally been OK, apart from occasional wireless problems and sometimes (especially with the Hub 5) broadband would die completely for some time necessitating a reset of the router to factory settings (and the subsequent manual re-applying of various settings). Apart from the latter problem, I thought that intermittent wireless issues were normal. Luckily, I use ethernet cables for most of my network so for most of my time with BT the problem hasn’t been a huge one. However as I purchase more and more mobile gadgets, the wireless infrastructure I need becomes more critical so this was starting to turn into a very real problem. It was then that I decided to take the plunge and look into purchasing a third party solution. Conversations with BT were not all that helpful (they did their best, but seemed inclined to blame my local network for problems rather than consider the idea that their hardware is not up to scratch). There are many third party options out there and prices vary widely. As I have a predominately Apple based system, I decided that an Airport Extreme would be the one to go for. This is a mid-priced solution for an 802.11ac device so was well within the budget for this project. I ordered it direct from Apple and the installation was pretty smooth – I had more problems extracting the box from the cellophane! You can see me unbox the new device in the video that accompanies this blog. 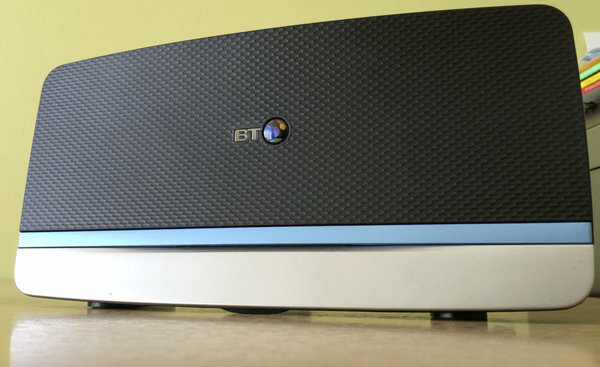 The main advantage to switching from the Hub 5 was that I was able to go back to using the BT Openreach VDSL modem. The Hub 5 has a modem built in, so if you’re replacing a device with an integral modem with a third party router then you may find a problem here. If you don’t have a dedicated VDSL modem then you can either purchase one, or use your existing router in bridge mode. How to do this is beyond the scope of this article or video. In the video you can also see me set up the device using Apple’s OS X based application Airport Utility. This is a different approach to most other routers out there that pretty much universally use a web browser to adjust their settings. Having an OS X application does mean that if you’re using a Windows machine then you’re out of luck (unless there’s a Windows version of Airport Utility that I don’t know about). In my video I mention a problem I had with my set up. And this is one that anybody changing to a third party router could stumble across. My BT Hub had a static IP address of 192.168.1.254. The Airport Extreme uses 192.168.1.1. This small, but significant difference means that you may need to update devices on your network to request their IP address (and route their traffic) via the different gateway IP. I needed to update several devices on my network to point at the 192.168.1.1 including my VOIP telephone, Cisco switch and Synology NAS. Once I’d made the change, my internet connection and network all came to life. In the half hour video above I go into detail about the unboxing, installation and, in summary, whether it’s worth upgrading from a free router to a paid one – and a paid one that costs a pretty penny! Has it been worth it? Have my network problems disappeared? Watch the video to find out! UPDATE: Since making the video I’m pleased to report that the issue where I had to reboot the Openreach modem has not happened again and I’ve been running successfully for several weeks now. This entry was posted in Computing, Hardware, Technology on May 30, 2016 by AJClayton.